Early signs that the US Fed may be pushing the envelope of rising rates and creating pressure on banks and borrowers are starting to show up more prominently now. One component of our research at Technical Traders Ltd. is to find data that may be overlooked or ignored by some other researchers. We believe that any pressures or hardships related to general consumers will be seen first in discretionary debt (credit cards, autos, and entertainment/activities). When consumers feel the debt pressure starting to build, they react by cutting back on certain discretionary spending – focusing their purchasing/paying abilities on essential items like food, human necessities (toiletries and other essentials) and maintaining essential components of their lives. One of the first things to watch is the delinquency rates for credit cards and autos. Additionally, watching for early signs of weakness in the larger metro real estate can assist us in understanding the health and dynamics of regional economies. Months ago, the levels of Foreclosures and Pre-Foreclosures were dramatically lower in major metro locations. Pre-Foreclosures are early stage Foreclosures where borrowers are behind in their mortgage payments and the banks have issued an “intent to foreclose” notice unless the borrower repays delinquent amounts. The Los Angeles metro is one of the largest and more diverse economies in the world. California is rated the 6th largest economy in the world if it considered a unique country. The ability to earn and spend efficiently within this metro is essential as it is ranked the 8th most expensive city in the world (Source March 2016 SCPR.org). There is a fine line between the balance of being able to afford to live in an area while creating opportunity and success and being priced out of an are because of constricting economic fundamentals. We believe this balance is beginning to skew towards a massive unraveling process. 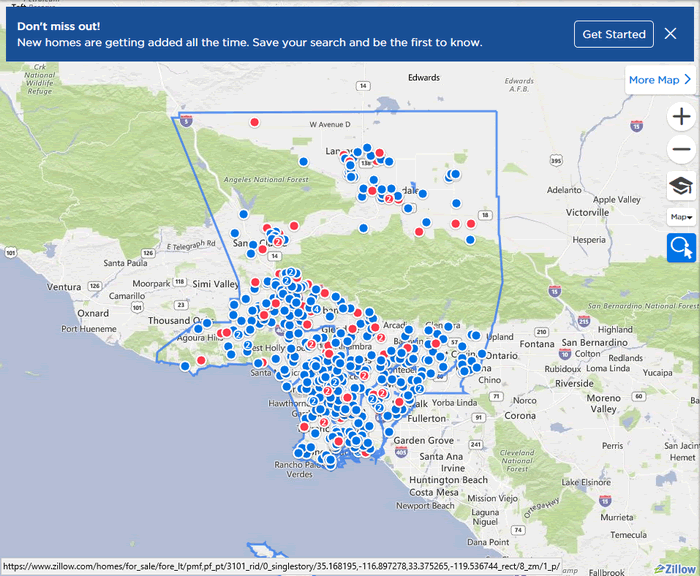 The BLUE dots on this image below are Pre-Foreclosures. 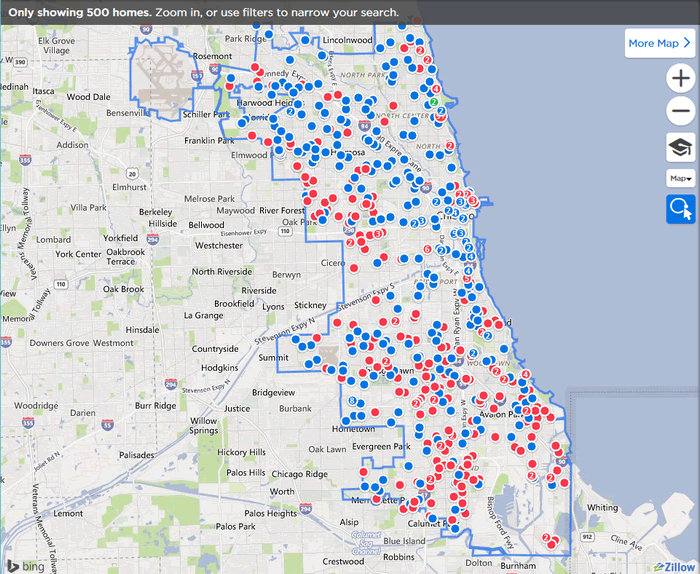 The RED dots are Foreclosures. Our research concludes that this early stage development of increased foreclosure activities and strains on the economic fundamentals related to this large metro are showing that pressure is building for an eventual market top similar to what we saw in 2008. We may still be many months or a year away from an eventual peak in the stock market, but the signs are starting to become more evident that pricing pressures are driving many borrowers into the foreclosure process while the regional real estate markets are about to be flooded with distressed property. The Chicago metro area is showing similarities to the Los Angeles area. 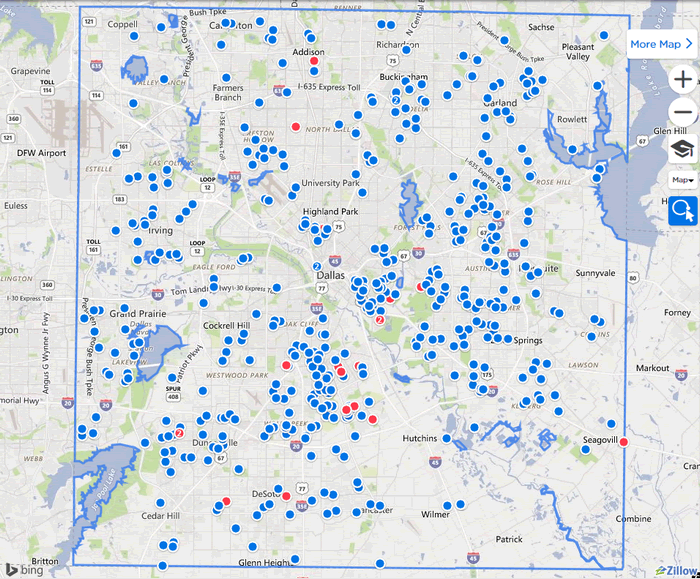 One clear visual difference is the larger number or RED dots showing active foreclosures. The Dallas, Texas metro is also showing signs of distress. As thousands of people have relocated to Texas over the past 14+ years and specifically since the post-2010 economic recovery, Texas has been a hot destination for business relocation because of favorable taxation policies and cheaper real estate. Given this continual demand for property by people moving to Texas following their employers, it appears that the fundamentals of the real estate market are changing and putting more pressure on borrowers. The US lending giant, Freddie Mac, reported a $3.3B loss for Q4 2017 – Source. It is our opinion that multiple factors are driving increased pressure for lenders and borrowers. Currently, Adjustable Rate Mortgages equate to about 6~8% of all borrowing within the US. We also believe the extended pressures related to the Affordable Care Act (Obamacare) and the US Fed raising borrowing rates are driving a fundamental shift in US economics. Specifically, the combination of these factors, as well as relatively narrow wage growth, are pushing many borrowers over a financial cliff. We believe the resulting wave of economic pressure will result in a dramatic opportunity for traders to capture spectacular gains from the resulting moves in specific stocks. We believe the US and global markets could be setting up for a massive rotational move down as these economic pressures continue to froth. As traders, we urge all investors to pay specific attention to the often-unknown economic factors at play in the markets. One of the most important aspects of our service to is to share our analysis so that you have some real predictive analysis data for research and review. We are not always 100% accurate in our modeling systems predictions or accuracy, but you can spend a little time reading our research reports through most of this year to see how we’ve been calling these market moves since well before the start of 2018. Visit www.TheTechnicalTraders.com to see what we offer our subscribers and learn how we can assist you in finding great trading opportunities. In fact, pay attention to the market moves as they play out over the next few weeks to see how accurate our research really is. We’re confident you will quickly understand that we provide the best predictive analysis you can find and are proud to offer our clients this type of research. In closing, don’t fall for the fear and panic articles. Stay aware of the evolving market conditions by relying on expert research and analysis like ours. Yes, the market is extended. Yes, the market may correct sometime in the future. Yes, the Fed has likely created a massive bubble. But it’s not over yet and the real trade is market segment rotation that is setting up. Hope to see you in our member’s area where we can share more data and research to help you profit from these moves – visit www.TheTechnicalTraders.com to learn more.